Almost all forms of behavior contain an improvisatory component. Although the options for action are often constrained by the implicit rules of the behavioral domain, particular actions are underspecified; agents have to fit their actions to the specifics of the environment—especially the social and cultural environment—and to the actions that have come before. Psychology and cognitive neuroscience, of course, exclude the improvisatory in the study of behavior both in an effort to simplify the object of study and because the underpinnings of improvisation are notoriously difficult to articulate explicitly. Humans appear to learn how to improvise by means of enculturation rather than explicit learning; improvisation is acquired as know-how rather than explicit knowledge. If we are to understand the creativity and spontaneity of behavior, however, we have to try to direct the methods of psychology and cognitive neuroscience at improvisation, from jazz to the quotidian interchanges of social life. The purpose of this conference is to take some first steps in that direction. We will ask about the psychological and neural processes that underlie the improvisatory in behavior. Louis Armstrong famously said that if you have to ask what improvisation is, you’ll never know. The time has come to ask, but what precisely is the question, or questions, and how are they best addressed? This conference aims to bring together neuroscientists, psychologists, music cognition specialists, anthropologists, social scientists, scholars of creativity, improvising artists across art-forms, and scholars of improvisation, all directed towards understanding how minds-in-bodies-in-cultures interact to produce improvisatory gestures and acts often rich with social, communicative, political, aesthetic, interpersonal and cognitive meaning and value. 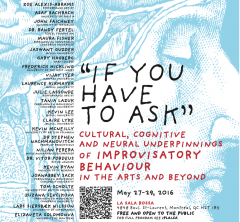 What should a culturally informed neuroscience of the improvisatory look like? What do practicing improvisers have to contribute to the questions we ask, the places to look for answers, and the answers themselves? What are the similarities and differences between culturally specific improvisatory actions in the arts versus those not operating within a particular artistic discourse and practice? Can the improvisatory be defined positively, and not just as an absence against the backdrop of some normatively defined practice? Is improvisatory cognition embodied in ways that distinguish it from other forms of cognition? Does collective improvisation and the distributed forms of understanding at play problematize atomic and individualist conceptions of the mind? 11:45-12:30 The Moment-to-Moment ‘Therapist’: What Emerges from Following a Child with Autism? Download a PDF version of the IPLAI/IICSI McGill Colloquium schedule.